With the cold weather in swing, homeowners often become inundated with unwanted pests. Hiring a pest control company to take care of scorpions before they become a major problem is vital to prevent from getting serious stings. Unwelcome pests can bring plenty of damage to your home, making it extremely difficult to get through the cold winter months. If your problem is termites, hire a company providing termite control in Mesa, AZ. Taking the right precautions for your home can limit how many pests come into your home. Follow these tips to keep unwanted termites and scorpions out of your home. Pests will start to accumulate in areas where there is a lot of clutter. It is important to remove excess trash and piles from the yard of your home. The garage and basement is another area that tends to be filled with extra clutter. Clean out your home’s garage to keep the scorpions from hiding in the garage and getting into the rest of the home. Wood piles and dead trees are one thing you need to watch out for as termites can easily make their home there. If you bring the wood into your home, it can end up causing serious problems for you and your family if they get into the structure of the home. Another major problem with the home is a leak in the basement. It is important to repair concerns with a leaky pipe, toilet, or dripping sink as it can lead to major issues for you and your home. If there is a leak, pests will easily come in and can create a home there. Keeping the leaks away can help to prevent the pests from becoming a problem in the basement or under the kitchen sink. If you hire Mesa termite control companies to handle the problems with termites and scorpions, you can be assured they will seal every crack in the foundation or windows that lead to problems with these pests. Check around the home every fall to look for cracks to prevent the pests from getting into the home. 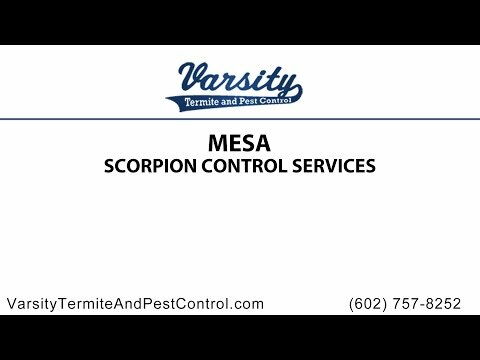 Anyone living in Phoenix and Mesa, or the surrounding areas, needs to contact a pest control company in Mesa when the weather starts to turn colder to keep these pests from making your yard and home their new residence. So what are you waiting for, contact us today and one of out professional Mesa exterminators will be happy to help you as much as possible. If you have any questions or concerns regarding scorpions in or around your home, we’ll provide you with all the information and answers you will need to know. We are here to help you! Our goal for our company is to keep everyone happy and safe in their own home with plenty of satisfaction.